Hot damn, the dopest party of the year, just keeps getting more fresh. 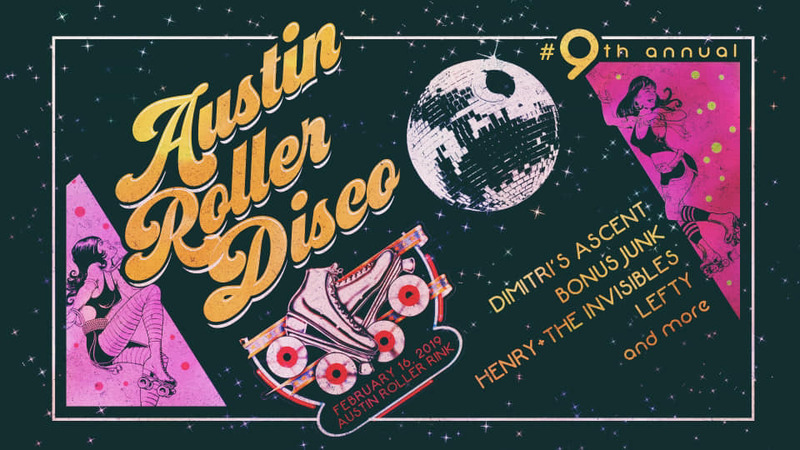 The 9th Annual Austin Rollerdisco is here and wilder than ever. As always, it’s a B.Y.O.B. late night afterhours Disco getdown, with a crushing live band and Austins best djs, until 4 in the morning. The ticket pricing has been streamlined this year to just 2 tiers...$25 Early Bird tickets, until they runout, and then they’re $40. Ticket price includes FREE skate rental!!! (first come first serve). This sells out every year so get your tix now before they’re gone. Henry + The Invisibles, Lefty, & Bonus Junk to this years lineup!!! As always Dimitri's Ascent’s will feature a full live disco ensemble complete with Austin’s hottest horn section and special guests all night long!